For this thirteenth episode, I talked to Guilherme Lopes, Co-Founder of RD Station, South America’s leading marketing automation software. Guilherme and his 4 co-founders have been building apps since 2005, operating from a city in the south of Brazil. In 2011 they saw a gap in the South American market and started building RD Station. 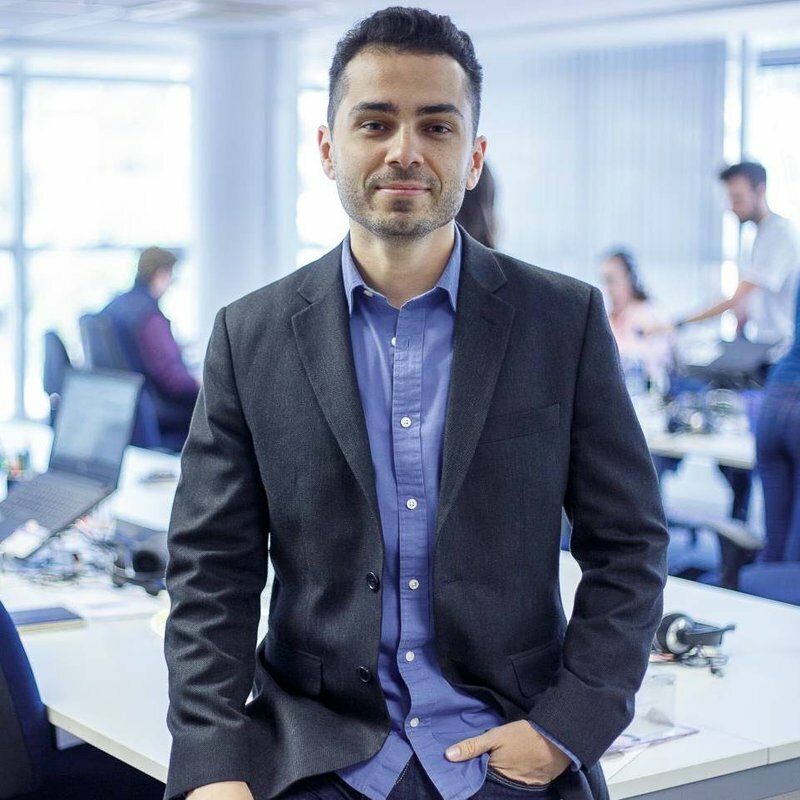 A product manager by background, Guilherme quickly assumed the customer success role within the company and is now leading a team of over 200 people. We have an interesting talk about personas, how to do good customer success and how to build great teams and structure. Jeroen: Hi, Guilherme. Great to have you on Founder Coffee. Guilherme: How are you doing? Great to be here with you today. Jeroen: You’re the Founder of RD Station. I think RD Station is mostly popular in Brazil and Portugal. Right? Jeroen: For those who don’t know what RD Station does, what do you guys focus on? Guilherme: Well, RD Station is a marketing automation platform. So it’s similar to products like Headstart, Marcato and others. But we focus on SMBs from emerging markets. So we lead the Latin American market. We’re also getting started in some other countries like Spain and Portugal as well. What it does, like any other marketing automation platform, is help companies acquire customers online, and grow their business doing that. It does so by offering the customer ways to convert their audience into leads, with things like a planning base, forums and pop ups. It then helps customers to start the relationship with those leads, with email marketing and automation workflows. The tool helps customers qualify leads with lead scoring and other segmentation. There are other kind of features that connect that with the sales funnel. So we connect with the CRM, help the sales guy understand what happened during the marketing cycle of that particular lead. And that, ultimately, is how companies sell more through their online channels. Jeroen: So RD Station is really about helping marketers generate leads and hand them over to sales people. Right? Guilherme: Exactly. Yeah, more or less. It’s about tweaking the sales cycle and automating a part of it to shorten it. Jeroen: You mentioned that it’s built for specific markets. What makes it better for, for instance, a Latin American market, or Spain? What makes RD Station different there? Guilherme: That’s a great question. First, we started here. We know the market and its needs better. We know the maturity level of the market here in Latin America and other emerging countries is different from what we see in the west, or Europe. What they need here is, first, more service. So we have a better layer of customer success, professional service, and also a very strong partnership program with marketing agencies that can offer good service at a reasonable price to our customers. They also need a reasonable price. So we have a price that is much lower than our competitors. They also need a simpler solution; we try to offer everything a platform should offer like all those features that I talked earlier about, but still present that in a simpler way for the customer to understand what they need to do. So, a different maturity level, different needs, different pocket and we think we have the perfect solution for all those different needs in a specific way for the emerging markets. Jeroen: I see. Can you give a specific example?Perhaps on how you make certain features more accessible as compared to other marketing automation software? Guilherme: First of all, we have less features – which is good because there is less complexity, for instance. In a more complex or robust company, you can have multiple funnels for different kind of projects, products, or personas. We only have one. For some companies, we see that is a limitation. Those are the bigger companies. But we see it helps our software become simpler for the ones that are just starting out with inbound marketing and other online marketing aspects. Jeroen: How did RD Station come about? What were you doing before RD Station? Guilherme: Well, we are five founders actually and we all have worked together before in 2005 in a company that used to build mobile apps. It was at a time when we didn’t have the iPhone yet. So we tried to thrive in this industry, but building mobile apps or using Java program language for those feature phones probably wasn’t the right timing and we failed because of that. It didn’t work. But we managed to get some attention from the Brazilian market and the Latin American market using inbound marketing techniques. We are from south of Brazil. It’s not a big city. It’s a small capital in the south of Brazil and most of the bigger brands and companies are concentrated in south Sao Paulo. We basically got their attention by writing content. Having a blog, we had a way to manage a relationship with the leads we were generating. Later, the five of us were working together in that company, but we started different ventures because it didn’t work and again, every one of us failed in our new ventures. I for instance, tried to launch a company to build television apps, that also didn’t work quite well. Jeroen: What does that mean – television apps? Guilherme: You don’t even know, that’s why it didn’t work. When you turn on your TV, there are some apps like – the simplest one being the channel guide. But you can build apps on those platforms and even connect to the internet or social networks and things like that. But that didn’t work because now everybody uses Netflix and they use that on their app, which is packed with a lot of different apps too. But again, I managed to get some attention from bigger brands and big companies at the time – like Sony and some different broadcasters. Again, all by doing some inbound marketing. Then we got together again. I mean we had worked previously in that mobile apps company, and decided that we were starting our own ventures. We tried to create successful startups but it didn’t work quite well because of different reasons – maybe the timing or maybe the quality of the work we were selling. But on all of those different startups, one thing that had worked quite well was the kind of marketing we were doing. We always had this mindset of creating a unique funnel that integrates marketing and sales, using inbound marketing techniques. We creates segmented work flows and then made marketing campaigns. And that was working! At the time, HubSpot wasn’t the number one platform because Marketo was bigger and I think Eloqua was bigger as well at the time. But they were growing pretty fast and had a more innovative way of thinking. We actually thought of reselling HubSpot and becoming a partner. Our CEO, Eric, actually approached them and they told him they weren’t looking at the Brazilian market yet so they weren’t interested. That’s when he decided to build our own product, get our own version of an inbound marketing platform which would be better than Marketo, Eloqua, HubSpot and is especially more adapted to the market we were in here. He told us the idea and we all ultimately left the jobs we were at to work on it. I am an engineer or used to be, I don’t know. I had a well paying job; I was a product manager trying to run the television apps division and we literally left our paychecks or salary behind to start living on our savings. We did this to fully commit to the company since day one. And that was really the most important differentiator in making this company very successful. We have a very good team that had worked together in the past successfully without fighting each – that’s also a common reason why startups fail. We were fully committed to the bones to have no salary, to work 24/7 on that new venture. That was really important in the beginning. Jeroen: How long did you work without a salary? Guilherme: Almost two years I think. Guilherme: Yeah. Almost. One year and a half actually. We actually started paying ourselves symbolic money that wouldn’t really pay for the rent or half of the rent. So we spent our savings for one and a half years, and almost all our personal savings too. When we got the first round of investment, which was actually an angel investment one year and a half later, I think we decided to start paying us some money to help with the bills. Jeroen: When was it that you started again? How many years ago? Guilherme: We started at the beginning 2011. So seven years ago. Jeroen: Okay. So, you’re in it now for about seven years. Guilherme: Yes, for about seven years. I like to think we are pretty successful so far. We grew from having no employees to 600 employees. Guilherme: And zero customers to about 1,000 paying customers. Jeroen: As a comparison how big is HubSpot? Guilherme: I think they have about 30,000 customers and 1,200 employees or maybe 2,000 employees, something like that. I haven’t checked the numbers lately but I think they are double in size. Now they have a much bigger revenue. We crossed the 30 million ARR recently. Usually when you think of a company with 600 employees, you think that the revenue is much more than that. But it is because we are a Brazilian company and one of our key differentiators is the price point and we are selling in our currency or the currency we have in Latin America. Those currencies are much weaker, cheaper than US dollars. We have less revenue when we think of dollars. Still, we have less costs because everything costs less and we also pay our employees and everything else on that currency so the math adds up and it works really great. Jeroen: Let’s say if you were to go to the US and start competing with HubSpot head on, then your cost structure would allow for much lower prices still? Guilherme: Yeah but also we would have to increase our cost of acquisition. I don’t know, by 10 times maybe. They probably have a cost of acquisition that is 10 times more than ours and that’s our differentiator. We do not plan to go into the US. We are not planning to compete with those established inbound marketing platforms you have there because that’s our differentiator. We have a much lower cost of acquisition here because of the kind of market we are addressing and because of the maturity level we found in these countries. So the whole company is optimized to work on emerging markets. On the other hand, HubSpot or others, don’t work really well here. For instance, if you look at Salesforce, they have got a really big chunk of the market here in Brazil. We still have more than 90 percent of the companies that don’t use ads to promote for instance. Among the 10 percent that use ads, you see a huge competition among Salesforce dynamics and other smaller CRM products like Pipedrive. The problem is for those big brands, they optimize their machines, their acquisition machines, their retention machines for the US market – for bigger brands, for bigger companies. Those things don’t work in the emerging markets. So when you get here with the cost of acquisition of 5,000 or 10,000 dollars, even more sometimes, you have to have a really high price point and really high retention rate and definitely really high profitability. And all of that doesn’t work well when you have a market, where usually companies have much less maturity and depend more on service. So the whole model has to change. That’s why I think we would fail competing with them at least in the bigger markets. And those big markets, they will also fail competing with us in these emerging markets. Jeroen: Got it. So your ambition is to stay strong at the emerging markets and to grow from there? Guilherme: Yeah, exactly. Our ambition is to solve the needs for SMB’s in Latin America first and foremost. I mean we’re focused on those companies and we want to make them really successful with our solution. Jeroen: Cool. What is it that you do personally at RD Station? Guilherme: I run the customer success department. As I said in the beginning, I used to be an engineer. I think that every other young engineer that starts a company that you will write the code, publish your software and get rich. I too thought that it would work like that, but it didn’t. When we launched our software, we were really successful from a sales perspective. We sold like 20 accounts in one month and that was like a big win for us. We celebrated that. But even though we are selling like 600-700 or more accounts right now, that was a bigger win for us. Then we discovered that customers, especially in the SaaS world, could pay for one month enough for the other. That was hard and we discovered that they use to call that thing churn. Also at the time, it was 2012 I think, at the time we were always trying to look at the Silicon Valley. We were studying the latest technologies and we saw that they were talking about this new thing called customer success. And customer success is not really much of a new thing. It is basically post sales reinvented in a new discipline – of course there are new concepts over that. My first impression was that they’re trying to come up with a better name for support and I was skeptical at first, especially when my partner and CEO asked me to think about starting this customer support department here at RD and help our customers be successful. I was skeptical. I was an engineer, I used to build products! But then I started studying it. It has already been six years and I started as a customer success manager, who does all sort of things for our customers at the beginning. So I was this big team of one person in the building and now the customer success team has more than 200 people. Jeroen: Yeah. It’s one third of the company then. Guilherme: One third of the company, yes. So as I said in the beginning that’s part of the way we work with our customers. We want to be close to them, we want to serve them, even though we are not charging for the service sometimes. But we decided that we want to help them overcome their problems with knowledge, maturity and resources. Right now, the customer success department comprehends the whole sales operation, and that includes professional services which is mostly implementation of services like onboarding. And then we have a team dedicated to support, and support is quick, reactive support, supporting the customers, breaks and fixes, and using thoughts and things like one can solve quickly using just an email for instance. Then we have the customer success management team and they help the customers throughout their life cycle after the onboarding period, and help them manage their plans towards success, and keep them from getting sidetracked. We help overcome all obstacles. The team is the most important point of contact inside of the company for the customer. We have these three different disciplines under customer success. Different departments under the parent customer success department here at RD. Jeroen: I see. Are all the five Co-Founders engineers? Guilherme: No. Four. It’s a company of engineers. One guy worked with business administration. He started the marketing department awhile back and he still leads the main agenda for the marketing team. From the four engineers, one, Bruno, became the CTO of the company. So he runs all the engineering. Eric, also an engineer, is the CEO. I’m customer success, marketing for Andre and Pedro, the fifth founder, works as an engineer with Bruno’s team. Jeroen: And out of all the engineers, why do you think you were the one that was chosen to, or decided to lead the customer success department? Guilherme: That’s a good question. I used to do product management – building the requirements, the specs and design of what our product will be. At the beginning, we had to pay for our bills, so we started selling services as a consultant but we were afraid of becoming a service company. We had walked that path previously and it didn’t work well. We tried to build products and we were tagged as a software house or a service company. And those kind of companies don’t scale very well. We desperately wanted to create a product that would scale. So our approach or way to sell service and produce service and still connect up with building a strong product was, to sell marketing services to companies and try to understand their needs. We would translate their needs into a product. So we would, for instance, create a landing page for them – coding the landing page. We would send email marketing campaigns, showing the exact results on an excel and anything like that. If the customers saw some value on that, it would be a green signal for us to build that feature inside of our software. After we built it, we would distribute it for free for those customers and ask them to try it, see if they like it and give us some feedback. So we were using those services to understand the customers, to actually do the customer development. And I got involved with that because I was fine creating the requisites and what would our software would be. So I started getting involved with services and customers and when you got the time for someone to help customers to overcome their challenges and become successful using our platform, I was the one that was more prepared and had more knowledge about that at the time. Jeroen: Are customer success and product management still one department at RD Station? Or they split up? How do they work together if they have split up? Guilherme: No, we split up long time ago. Actually at the time, we moved to customer success and we created a committee to come up with ideas and specs for the product but later on it became part of the engineering product and now they split it again between engineering and product. Jeroen: And this committee you are talking about, who is on the committee? Guilherme: At the beginning the engineer guy was Bruno, me the customer success guy, and the marketing because we were selling a marketing product. Jeroen: Got it. So you involve the marketing team in product decisions at RD Station? Guilherme: Sure. Actually we, for a long period, we were our most advanced customer. As people like to say, we eat our own dog food. Nowadays, we can’t use ourselves anymore in a customer model because in some ways we have outgrown what our ideal customer looks like; they have different needs. We already are a big company and that doesn’t necessarily translate to what our customers need. But at the beginning, we were exactly that – a SMB for an emerging market trying to be successful using an inbound marketing platform. So yes, marketing has always had a big say in the product. Jeroen: So, if you moved from being your own persona to not being it anymore, did it change the way you guys work? Guilherme: Well this basically changed the way the product team works. So when they would think of working on a new feature or improving a certain feature, the first thing they used to go to the marketing team and ask them their pain points, who is using those features, their feedback and all of that stuff. They still do that, but it is more like a recommendation. Now what they do is, interview a set of customers that better represent the most common persona we have. Jeroen: That’s cool. What is your focus exactly right now in the customer success department? How do you spend your typical day? How do you go about growing things? Guilherme: Well, our company has a big big challenge – my department particularly. It is to grow our retention rates and expansion rates for a product that is relatively complex and you’re selling to SMBs. When you think of that equation, you think of churn. You wouldn’t sell a complex software for SMB and expect a very good adoption and retention rate. But still we want to overcome the challenge with a very well instrumented customer life cycle that we try to map, to go along with what we call ‘educational methodology’. So our customers need more knowledge. The more they know, the more they will use our software. We created this methodology, called the ‘growth machine methodology’ and we have all these different success milestones. Like, the success milestone one is trying your first generation campaign. Success milestone two, is starting to build a relationship with your leads, and three is create accountant plan and so on. So we defined it into different steps based on the maturity level of the customer. And we tried to tie that together into the customer life cycle. For instance, success milestone one is what we try to achieve during the onboarding period. So we sell an onboarding package to tie to that. And after that, DCSM will help the customers to follow the path and overcome each one of those different milestones. We also create a lot of content organized around that methodology. We think that with a very strong methodology, you need good educational content. That’s why we created a university called “RD University” and we are not only producing content for our customers, but also for our market leads and potential future customers. With that well orchestrated life cycle, we offer implementation specialists, customer success managers, support, and different specialist for different needs, different stages of life cycles. We still need to instrument this better so that we are having only one conversation with one customer, to avoid being repetitive or confusing the customer. Orchestrating all of that together, we can create a success machine that will accelerate the potential growth, the potential success for the kind of companies we are selling to – SMBs from emerging markets. That per say, is an enormous challenge but we’ve had some success so far and we’re still improving. Jeroen: So what are some of the things that you gradually spent more time on? Guilherme: I spend a lot of my time helping the implementation team to fine tune the tasks of the implementation so that they don’t end up delivering a project that does not tie to the overall goal, to the long term plan. We need to tie those things together. Then, I spend time with the customer success management team to help them receive the customer output, implementation, and create a very strict operational methodology where they will accelerate customer growth, customer success, through orchestrated and proactive touch points. We work with SMBs, so it’s a high volume operation. We can’t rely on the customer success manager talent itself to understand the customer’s needs, problems and then translate them into a plan and help customers stick to the plan. So, I need to instrument a system to show warnings and alerts to those CSN’s so that are able to quickly understand what is going on in a couple of minutes, call the customers, and be well trained using our methodology to help the customer understand what is the next best logical step for them to take and come up with some tactic for them to do that. And they need to do that at scale. So they need to do that one hour call for all the customers. Building this operation is something really hard. You need very good systems in place and need very good process dashboards, individual dashboards, performance review, in view of poaching and all of that stuff. So I spend most of the time thinking of how to translate this strategy into something tactical and working with leaders of each team to personalize or orchestrate all of that. Jeroen: Sounds like a huge challenge. Guilherme: Yeah it is. It’s a good thing I’m engineer. I think of customer success with an engineering mind. Jeroen: Yeah, with a process mindset. So how many hours do you work on RD Station every day? Guilherme: Hours? Well I’m a big fan of routines. I don’t see myself as a disciplined guy, but that’s why I’m big fan of routines because when I put in place a straight crew team it helps me be more focused, stay energized, put out today and deliver more in the same amount of time. And that means not only being disciplined about how many hours you work on, but also what you will work and your free time – your reading time, praying or meditation time, about the time you spend with your family. Because without those things, you will become an imbalanced professional and an imbalanced professional, cannot deliver results. So, in terms of hours, I usually wake up at six, shower and meditate. I get some eggs, a nice couple of coffee, and I start working from home. I try to not step into the office until noon because I am much more productive in the mornings. I try to spare the time for ‘makers time’, where I work on projects – the most important objective there is for the day. I try to finish the most important object of the day by 10 at most or 11. And then I go to the office. My afternoons are full; usually fully booked with meetings, so I have like five meetings in a row in the afternoons. When you have a 600 employees company and you are the founder, you know a lot how often things work, you don’t necessarily have everything well documented and instrumented. So people tend to come up to you to ask some things and I try to not have quick chats with everyone that steps into your office every 15 minutes. I try to schedule, even if it’s a 20 minute meeting. For every meeting, I try to have an agenda and objective and with that in mind, I will do things usually with the leaders of my team, so I have right now eight direct reports. I do the same with my peers, other executives of the company and any other person on the inside. We often do these skip level meetings, we do talks, provided that they have an agenda or an objective – I schedule a meeting with anyone. It keeps the proximity with the whole team. So that’s why I come in to the office for a lot of meetings. So there is a lot of talking during the afternoon and by the end of the day, exactly 6:30, I go to the gym. And as I said, that is also a part of getting balance in your life to become more productive. Everyone needs to exercise and my latest hack for doing exercise every day or at least three times a week, is hiring a personal trainer. Not because I need it, but because I am paying and I am committed because I’m paying. And second because he’s waiting for me 6:30 three times a week and I have to go and so I won’t let him keep waiting for me. That forces me to get back to the gym and home and that forces me to deliver whatever I needed to deliver within the hours I have in the office. So I go, I exercise, I dine, I chill out and on a perfect day, I will sleep. Sleep early, like 10 in the night, so I can have at least seven to eight hours of good sleep. And of course, sometimes there is a third time of the game which is during the night. If something has to be done for the next day, I work one or two more hours during the night. I try to avoid that because that prevents me from having a good sleep not only because of the number of hours I’m sleeping but also because I go to bed thinking of that thing that we’re doing because didn’t have time to chill out and everyone needs at least six hour of good sleep so they can be more productive during the day. That means that you can work 9-10 hours in a day, but it will still produce the same amount of work that a person might take 16 hours for. Jeroen: Cool. That sounds like a hell of a routine. Guilherme: It’s quite simple actually. But you have to be disciplined. Jeroen: Yeah. If you have this kind of routine, it provides some kind of stability I suppose. Like I read once, it’s a writer but I forgot the name, he said something like that you need to have some routine so that you can be more creative in your work because you create some stability through your routine which then makes it that you don’t have to focus on these things. So that when you’re actually creating things, you have the energy and the time to do it. I think I would try it once. Guilherme: I’m a big believer in having a routine for things not related to work. If you are not disciplined about the quality time with your family, if you’re not disciplined about having quality time for praying or for exercising, then you just think that you need spare time and those things will naturally fit on that in the spare time. But it just won’t happen and you need all those things to refresh, rebuild, become more creative, do better with the stress and the pressure. Jeroen: Yeah, definitely. Talking about writing and slowly wrapping up as well, what’s the latest good book you’ve read and why did you choose to read it? Guilherme: The latest book was the Jocko Willink, the discipline playbook I think or field play book of discipline. It is actually a quite simple book but it’s related to some of those things we were talking about and how discipline means freedom. We can only be free if you’re disciplined with things you try for. Jeroen: I found the title of the book. It’s Discipline Equals Freedom a Field Manual by Jocko Willink, right? Guilherme: That is the one. It’s a good book to understand this concept. Jeroen: Cool. Last question, if you were to start over with RD Station, what would you have done differently? This is the most difficult question. Guilherme: Yeah, it is difficult because of course I would have done a lot of things differently because you learn along the way. Still those learnings are important because of that cliché that ‘the journey matters the most’ is actually true. I wouldn’t learn the things I learned if I hadn’t made those mistakes. But since I already have the knowledge, some of the things I would have done differently, I would since day one try to create this success machine in a more scalable way, thinking of either a replicable operation and thinking more of a funnel. I would not do whatever is needed to make a customer successful, I need a very good machine that will turn that customer successful at a very good conversion rate. And that needs to work in a well oiled fashion. That’s one thing. So I would think of success not as art, but as science and at scale. The other important thing is thinking of our persona. In the beginning, you want to sell to someone who has a cost and a wallet. You still don’t know exactly what your product will become, who will be more successful with your product. It takes you some time to say no to certain kind of requests and certain kind of customers. So right now, we have a better understanding of what our persona is and know more of what is the kind of customers that won’t be able to achieve success with our product; we call them the bad fits. In the beginning we didn’t know that, but now we do and we could have gone or grown much faster if we had that knowledge in the beginning and if we had built a software thinking of that persona and if we had also not tried to pursue or sell or make those kinds of customers successful. So those are of course the things I would have done differently. Thinking from a customer success perspective. Jeroen: Yeah. More processes, more focus and more system. Guilherme: Exactly. You can’t have success unless there is more science to a scalable machine and thinking of your persona segments. Jeroen: Cool. Thank you for your advice and thank you Guilherme for being on Founder Coffee. Guilherme: Thank you too. It was nice talking to you and to be here.